Are you after a designer look for your dining room, without having an endless designer's budget? Well we've got it covered. 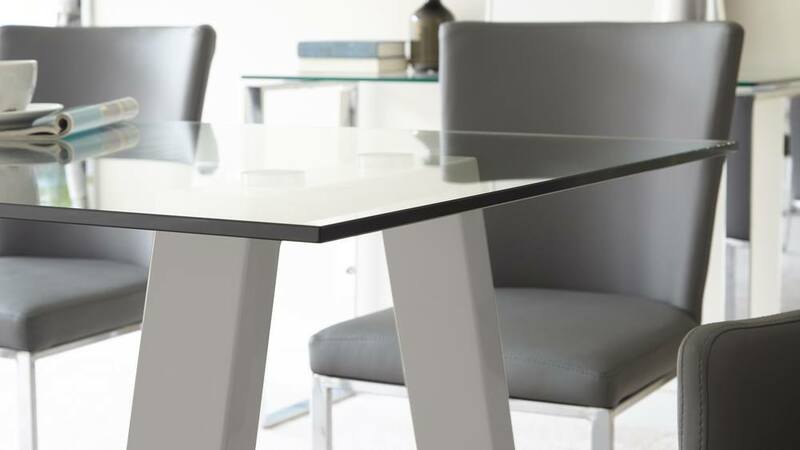 The Zen 6 Seater Glass and Grey Gloss Dining Table, from the Exclusively Danetti with Julia Kendell range, is such a considered, well designed and stylish piece that is sure to have friends and family complimenting you each time you sit down to dinner! The Zen dining table measures 75cm in height, 80cm in width and 160cm in length. This sizing means the table can easily accommodate 6 guests, but the design of the table means that you can either have three sat along each side or you can have two on the sides and one at each end. This makes seating arrangements really versatile. 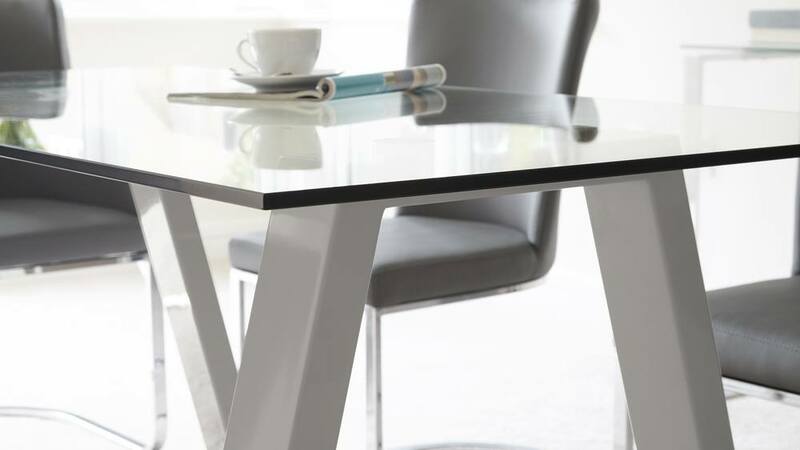 The rectangular table of top of the Zen table is made from tempered glass. The glass itself is really reflective which has a visual lightness to it. This creates an illusion and feeling of more space, allowing you to really maximise the room you have available. We use tempered glass for all of our glass products because it is incredibly durable and so simple to maintain. You needn't worry about having a glass table around family or young children, as tempered glass is one of the strongest surface materials you can get for the home. 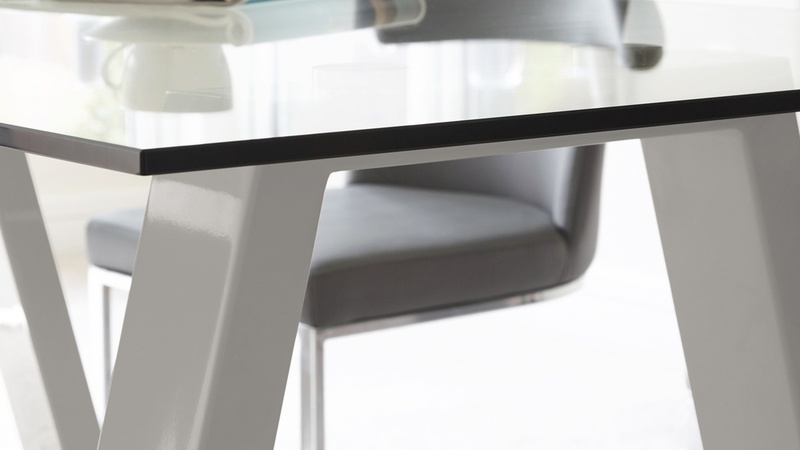 To keep the legs in proportion with the slim glass top, the legs on the Zen have a slim side profile. 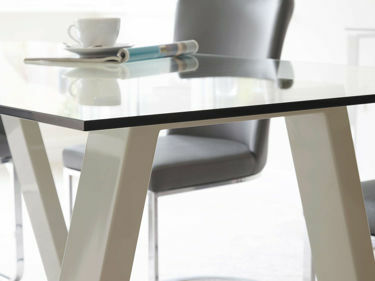 We've used steel for the legs with a quality gloss coating so that the frame is still fully supportive of the table top. It's a really strong frame but still looks effortlessly slim and elegant. Another really clever feature of the table legs is the actual engineering of the frame itself. The legs are a V shape with a cross bar at the top, rather than the legs just poking out from the glass table top. By adding the under frame, this gives the Zen dining table such a stylish design feature alongside lots of extra support and stability. The application of the grey gloss for the table legs is a multistage process involving 3 coats of gloss, each dried for 24 hours. The legs are then hand polished to achieve its highly reflective shine. It's this layering process that gives the grey gloss finish its depth and durability. A rectangle is one of the most common shapes of dining table as they fit so easily into a range of interiors. This is because generally, they reflect the shape of the room. So pairing this shape with the spacious leg design was a match made in heaven, as there is plenty of room for all the family to comfortably sit at the table, without the table legs getting in the way. 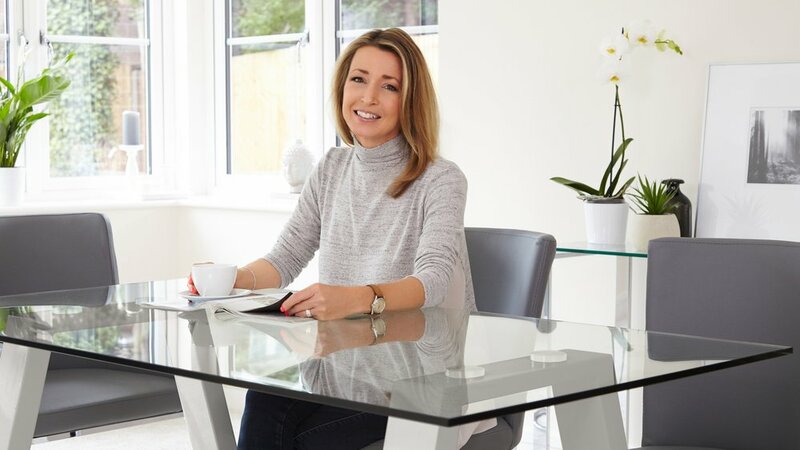 If you love the look of the Zen 6 Seater Glass and Grey Gloss Dining Table, why not take a look at the rest of the Exclusively Danetti with Julia Kendell range which is home to a variety of designer pieces. Considered Engineering Equals Coordinated Design. 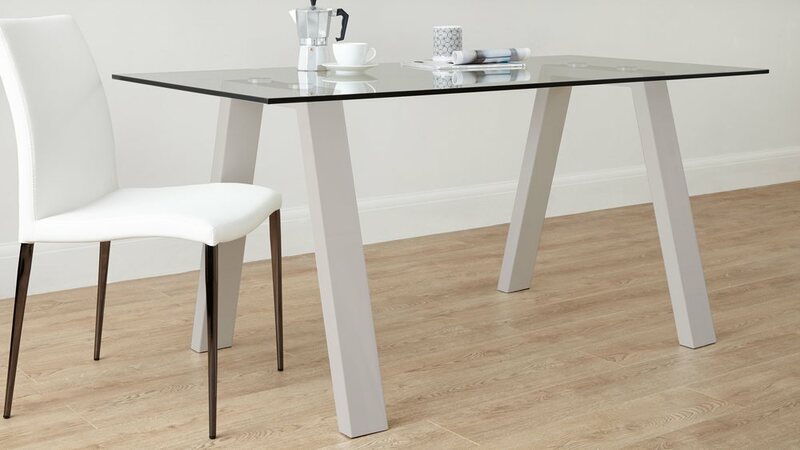 No detail has been left to chance with the Zen 6 Seater Glass and Grey Gloss Dining Table, especially the intuitive design of the leg frame. 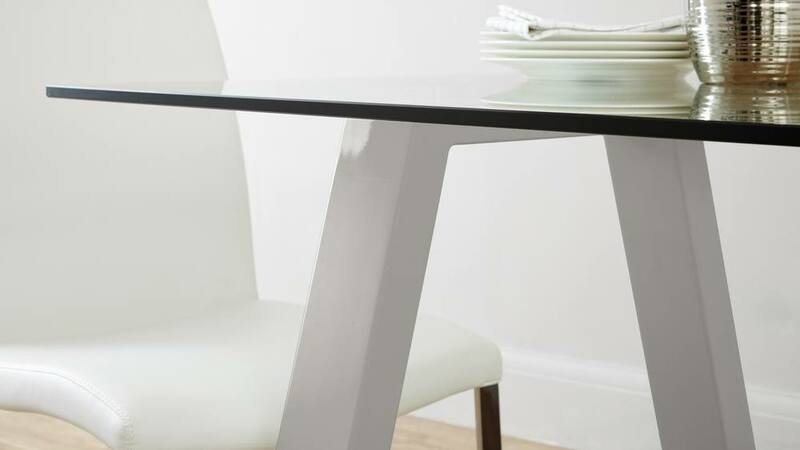 It’s a subtle but super effective design feature that makes a world of difference to this stylish modern dining table. 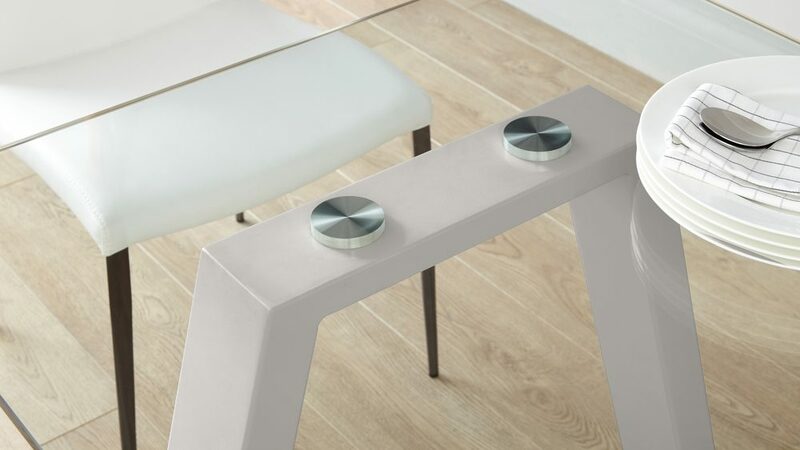 In the original design of the Zen, the legs are slightly chunkier to accommodate the thicker table top, but we found this didn’t work the same when it came to switching to a glass table surface. This is why we have slimmed down each of the leg frames to keep it proportional with the streamlined glass table top. The benefit here is that the leg frame is just as sturdy and strong as before, but with a much more cohesive and elegant appearance.